Not sure what the 5th news is... the previous post? I think it pretty strange if it is true. I know of Hanuman of course...I have read the Ramyana. Thoughts and Prayers for you and yours... I am glad your are feeling a bit better.... Love the pics! Take Care! 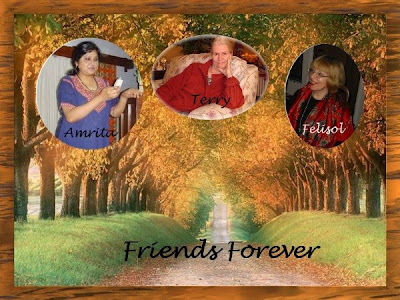 Hello Amrita, love the picture of you and your friends. Also,may God be with those who are ill. Glad your feet are doing better. I know what it is like to suffer with pain in the feet. Dear Amrita...for sure and I am not talented at all.! The whole thing comes from that cheap little "Picture It" disc! I hope that I gave you the directions clear enough. Then you will be doing lots of your own pictures. We are getting hot weather now and I must admit that I like it. Poor Mrs Mac is drowning in rain in Idaho! My brother lives in Iowa where they are having really bad storms. There is so much tragedy going on these days...I really believe that the Lord must be coming soon. It is too bad about your aunt falling She falls a lot, eh? Do bad feet run in our family because why are your feet getting bad. What is the stuff that the doctor gave to you Amrita. Is it a prescription? Sorry Curious Servant, it was a joke. The 5th news was about B Obama on my blog LOL. Oh really you have read the Ramayana! Then you know quite a bit about Hindu mythology. Sorry to hear about your foot and of course Aunt Sybil's fall. A very tough condition to bear, when the feeble person and the caretaker are both unwell. I pray for your hasty recovery. Homeo also has medicines to retard growth. So perhaps you can look up the Doc again wrt the bone growth. Only God knows, His reasons for giving physical ailments. And only He can cure, or lead us to those of His Servants who work on His behalf. what a lovely picture with you as the jewel in the crown. I'm looking forward to seeing what composing will come from you as well in the months to follow. You must have a good homeopath since only one dose would help. I've tried in the past, that took a lot of time. Thing is, we are too impatient for treatment to have its time to work. Many times I think that the wonder of the penicillin has done us more evil than good. We will not longer wait for our body to rebalance to get time to heal. I mean if being overworked makes my muscles hurt, I should perhaps give my body rest and time to get rid of its waste instead of popping pills and continue to strain my muscles. A hundred years ago cure baths where people came to relax, take healing baths, get massage, drink purifying water, make slow walks e.t.c. were probate treatments to anything from tuberculosis to brain stroke. I don't mean that we do not need or profit from pills, on the contrary, but sometimes healing takes time, and it seems to me we have not got any patience, or opportunity for that sake, to seek complete cures. I also find that homeopaths more often will see the patient as a whole being than a modern doctor. I think you are doing the right thing in seeking hiim. I am also aware of the fact that time is often what is most costly to us. I'll pray for your aunt Sybil and for Ruan. I always find it comforting when ill and healthy put their lives in God's hands. He certainly is the great healer and provider. Thank you, Amrita for being such an empathic sister and co-prayer. Praying for you and your family (((hug))). it seems that you are being tested daily ... but praise the Lord - HE continues to deliver daily as well! The flowers are lovely, as are the three beautifuly flowers in the picture above it! I will be praying for your family and friends...God is greater!! Thank you friends for your prayers. Aunt Sybil 's pain is much less but she needs asistance and constant supervision. yes Terry we have orthopedic problems in my family. The pills the doctor gave me are Calcarea Flour 6X. Its a Homeopathic treament.Its worked wonders for me. You 're right Julia, it shrinks bone growth. Like you Felisol I also believe in looking for alternative medicines. My arthritis problem is much better after taking herbal meds. But i had to try various medication before i hit the right one. Will Pray as I think of you and those around you. How lovely are the feet of those who spread good news. Your poppies are gorgeous! I'm happy you are able to find relief for your feet. When my feet hurt, I can't concentrate on anything. I prayed for healing for you and your aunt, for your injured or painful feet. You are right, we are all in God's hands. I'm so glad that you were relieved of your pain. Praise God for that. I will be praying for you and for your friends who need prayers. I love the flowers at your garden. They speak so much of your love and devotion for them and for the people you are ministering to. God bless you and your loved ones always my friend. STanding with you in prayer, our God is big and able. Believing with you.